July 9, 2012 , Auburn Hills, Mich. – The Dodge brand reveals its recipe for the groundbreaking all-new 2013 Dodge Dart in a new 90-second commercial debuting Tuesday, July 10, during the Major League Baseball (MLB) 2012 All-Star Game broadcast on the Fox network. “How to Change Cars Forever” is a rapid-fire “instructional” spot on how to make a world-class car today, providing an inside look into the Dodge brand’s approach to designing and engineering its much anticipated entry into the highly competitive compact car segment. The TV spot introduces the tagline, “New Rules,” which speaks to how Dodge is redefining what a compact car can be. It will be followed this summer by 30-second and 60-second versions airing on major broadcast and cable networks and in movie theaters as Dodge Dart vehicles arrive in dealerships nationwide. A full, multifaceted marketing campaign will launch in September and will include additional TV spots, print and digital advertising running in major media outlets. The 90-second “How to Change Cars Forever” spot will continue to air in high-profile television events throughout the remainder of the year. The commercial was created by the Portland, Ore.-based advertising agency Wieden+Kennedy and can be viewed here . The spot features the Jay-Z and Kanye West track, “No Church in the Wild,” from their “Watch the Throne” album, and it includes cameo appearances by a couple of athletes who are champions in their respective sports. Dodge is using high viewership programs and pop culture summer events to build momentum and interest in the Dart among key consumer groups, including young professionals who may be purchasing their first car and “boomers” who may be re-entering the compact car market looking for mid-size interior roominess with the affordability and price position of a compact car. In addition to the new spot airing during the All-Star Game, Dodge will be the official sponsor of MLB coverage on CBSSports.com in July and August, including a July 10 “takeover” of the CBSsports.com fantasy baseball page. Viewers will be invited to learn more about the Dodge Dart through an expandable gallery of vehicle images. 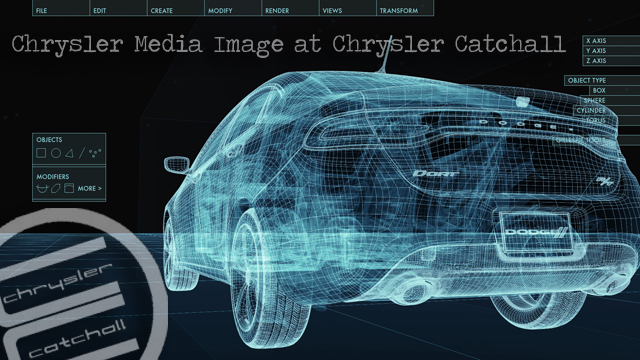 When clicked, each image leads to the Dodge brand’s webpage for additional information. Beginning July 11, Dodge will partner with Viacom to launch a multiplatform program allowing fans to interact with the new Dodge Dart in a fun and engaging way. In addition to the 30- and 60-second “How to Change Cars Forever” spots airing on Viacom’s MTV, VH1, Spike and Comedy Central, Dodge and Viacom will launch the Dodge Dart Challenge: “Live in It to Win It” in San Diego. The challenge will be integrated into Viacom’s coverage of 2012 Comic-Con International, the largest comic book and popular arts convention in the world, across Comedy Central, MTV, MTV2, Spike and VH1. Four superhero-costumed contestants will compete in a four-day challenge for a chance to win a 2013 Dodge Dart. Each contestant will earn points by completing various skill challenges inside and outside the vehicle and can earn additional points via text voting. Fans can watch the challenge unfold live from July 11-14 at http://www.dodgedartchallenge.com. The Dodge brand partnered with deviantART.com and three other influential online communities for a series of “Inspired by You” contests challenging individuals to create Dart-inspired works of art, songs, clothing and skateboard decks. Taking advantage of big summer blockbuster movie releases, the 60-second “How to Change Cars Forever” spot will run in theaters nationwide from July 20-Aug. 31. The Dodge brand has been strategically building awareness and momentum for the Dodge Dart since December 2011 through targeted relationship building with key consumer groups via the brand’s website, social media initiatives and customer communications. From May-August, the brand is partnering with four influential online communities — deviantART.com, ReverbNation.com, Transworld and .Free Clothing Co.– to challenge individuals to create Dodge Dart-inspired works of art, songs, clothing and skateboard decks. The aptly named “Inspired by You” contests are aimed at young professionals who share the same passion for art, design, music and technology as Dodge Dart designers and engineers. By working with these online communities, the Dodge brand is engaging more than 25 million technicallyminded, creative individuals not necessarily reached through traditional media. The contest with deviantART, the world’s largest online art community, reached more than 22 million registered members and led to nearly 4,000 traditional and digital works of art submitted from all over the world and all inspired by the Dodge Dart. The top 50 entries art can be viewed at http://www.redlinedodge.com/2012/06/08/deviantart-inspired-by-you-contest-winners-selected/. The all-new 2013 Dodge Dart leverages the world-class architecture and DNA of Alfa Romeo and then infuses it with Dodge passion and design, creating an agile, fun-to-drive compact car with mid-size levels of interior roominess and unmatched style, technology, safety and customization. The Dodge Dart brings features and contents never before seen in the compact car segment. With a U.S. manufacturer’s suggested retail price (MSRP) of just $15,995 (excluding destination), the new Dodge Dart is a thoroughly modern vehicle that’s beautifully designed and crafted with high-quality materials, attention to detail and precision craftsmanship. With an available fun-to-drive 1.4-liter MultiAirï® Turbo engine, great ride and handling characteristics compliments of the Alfa Romeo-based chassis, innovative interior style featuring high-quality materials, splashes of color — like Ruby Red and Citrus Peel — and cool technology not found in the segment, like the available class-exclusive 8.4-inch Uconnect Touch Screen and 7-inch thin film transistor (TFT) customizable gauge cluster, as well as class-leading safety features, such as 10 standard air bags, and innovative style including available class-exclusive LED “racetrack” taillamps and integrated dual exhaust, the 2013 Dodge Dart sets a new standard in the compact car segment. For nearly 100 years, Dodge has defined passionate and innovative vehicles that stand apart in performance and in style. Building upon its rich heritage of muscle cars, racing technology and ingenious engineering, Dodge offers a full-line of cars, crossovers, minivans and SUVs built for top performance – from power off the line and handling in the corners, to high-quality vehicles that deliver unmatched versatility and excellent fuel efficiency. Only Dodge offers such innovative functionality combined with class-leading performance, exceptional value and distinctive design. With the all-new 2013 Dodge Dart, the all-newDodge Charger paired with the ZF eight-speed transmission that achieves a class-leading 31 miles per gallon on the highway, the new Durango and the significantly revamped Grand Caravan – inventor of the minivan – Journey,Avenger and iconic Challenger, Dodge now has one of the youngest dealer showrooms in the United States.